Each charging Board includes 23k Gold, Mixed Gemstones, Pyrite, Shungite, Obsidian, Blue Kyanite, Selenite, Jade, Quartz and Hematite. 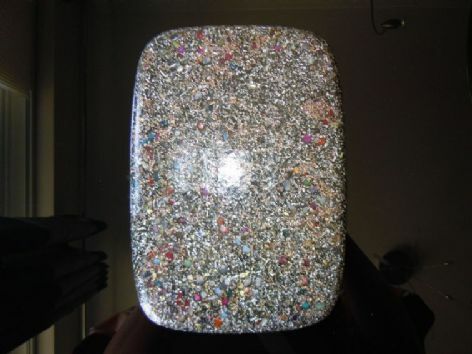 This combination of crystals will help the disc self clearing/charging and will immediately charge the object placed upon it with high frequency Orgone energy. Customers have advised me that once they place oil's and herbs upon the disc they have noticed a difference in energy. THis is nice to put fruit on I put a fruit on it and it keep fresher long time.